Located in the Eastern end of La Quinta, Trilogy, built by Shea homes, rests against the base of the Santa Rosa Mountain range, at the very end of Madison Ave, just past Andalusia and PGA West. 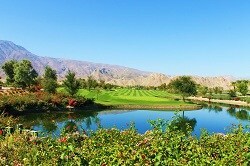 Trilogy, at the end of 2012, changed it’s name to Golf Club at La Quinta. This 55+ community is for active adults who want to be on the go, yet have the option to relax in the desert sun if they choose. Remember that only one resident of the home needs to be 55 or over. The heart of Trilogy at La Quinta is the Santa Rosa Club. At 21,000 sf, this athletic club houses fitness machines, an indoor track, an indoor lap pool, computer rooms and a myriad of classes. There is also an outdoor resort pool which overlooks the phenomenal tennis courts..four lighted championship courts. Fine dining is available at Azul Restaurant and Bar, overlooking the golf course. The beautiful golf course, designed by Gary Pranks, swirls and rolls amongst the homes. Trilogy is far enough away from the hustle and bustle to make you think you’re in your own desert oasis, yet it’s only about 30 minutes from Interstate 10. Old Town La Quinta is located approx. 15 minutes away with it’s shops and restaurants, and the world famous polo fields are less than 10 minutes away. Trilogy offers 1200 single family homes. Home styles vary, with a California ranch and more traditional look and feel to the Trilogy community. Trilogy homes were built from approx. 2002-2015. Very reasonable HOA’s and pay as you play golf encourages brisk sales. Golf: 18 holes, public. Pay as you play. People that enjoy Trilogy also tend to like Sun City Palm Desert, Heritage Palms Country Club, and also Sun City Shadow Hills in North Indio.